M ost of my Macro work was done using reversed lenses. For most work I use the Nikkor 50mm F1.8D and for higher magnification I use the Nikkor 28mm F2.8 AI-S. I have found the best comprimise between diffraction and depth of field to be at f/11. Both lenses have 52mm filter threads allowing the same 13$ reversing filter to be used for both lenses. The use of the 28mm lens gives a high magnification of around 3x and requires the flash to be closer to the subject. The limited depth of field, as well as hand holding, requires many shots to be taken. With my SB-600 this requires the flash be set to about 1/2 or 1/1 power to properly expose the photograph. The recycle time of this high power setting is too long to be reliably used to quickly. 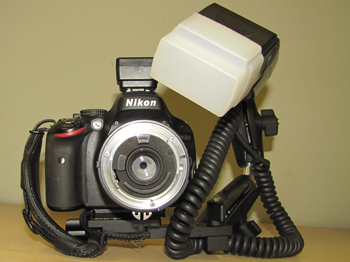 The Wimberly F-2 Macro Flash Bracket is perfect at allowing me to position my flash in any position. 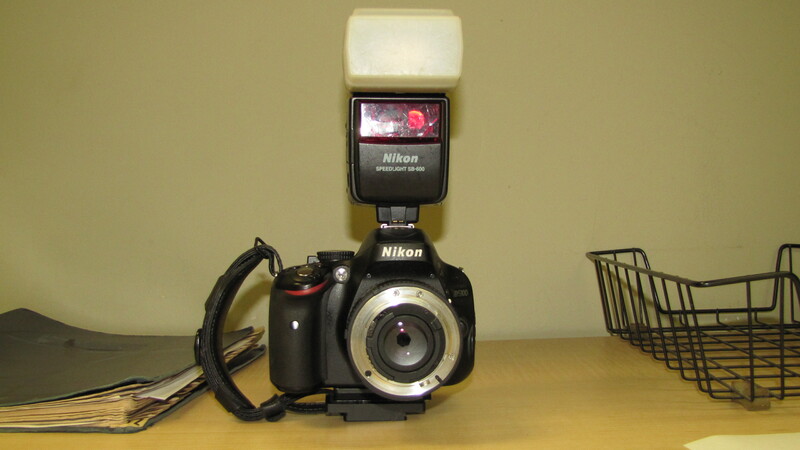 It is seen in the first, and allows the flash to be closer to the subject allowing the 1/4 (-1/3) powersetting on my flash to be used, giving a quick recycle time and thus solving the problem. 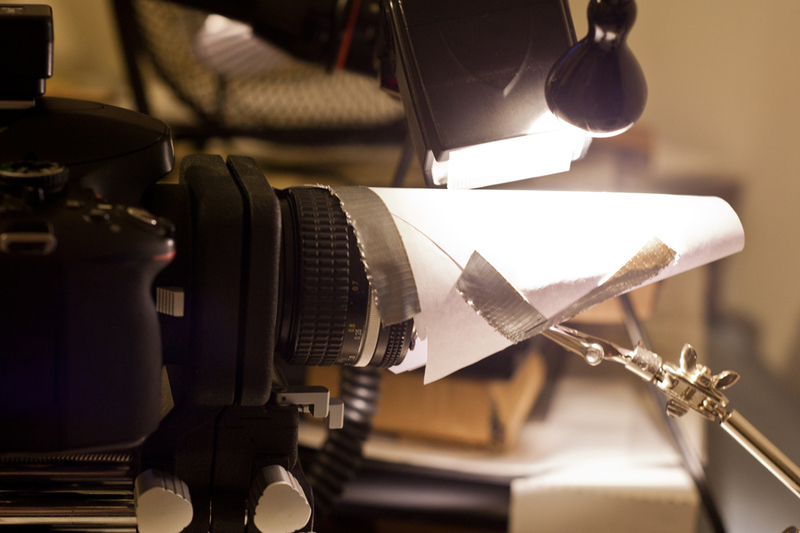 All this is without spending thousands of dollars on Macro lenses, or expensive macro flash systems. W hile most of the shooting I do is in the field I also have a focus stacking studio. Focus stacking involves taking many photographs of the same subject with different parts in focus and then combining them using software. I use Zerene to stack my photographs. I use a Nikon pb-4 bellows which is mounted on a Parker Linear Bearing Stage. The linear stage is designed for optics and is actuated by a Mitutoyo digital micrometer allowng 0.001mm resolution. The flash is mounted off camera I have posted a photograph of the lighting set up.